The California region of the Haiku Society of America has one of the richest histories for haiku poetry in all of the United States. Many Japanese American poets wrote haiku in California early in the 1900s, and continued to write them while incarcerated in relocation camps during World War II, as documented in Violet de Cristoforo’s book May Sky: There Is Always Tomorrow. Haiku also played an important part in the San Francisco poetry renaissance in the 1950s, influenced by and influencing many Beat poets, especially Gary Snyder, Jack Kerouac, and Allen Ginsberg. In the 1960s, Helen Stiles Chenoweth led the Los Altos Writers Roundtable, a haiku group in the San Francisco area that in 1966 published a bestselling anthology titled Borrowed Water—one of the earliest anthologies of English-language haiku, if not the first. Later, Los Angeles was the original home of Modern Haiku, the oldest haiku journal still being published in North America today, founded in 1969 by Kay Titus Mormino. Early English-language haiku activity also included the Yuki Teikei Haiku Society, founded in 1975 by Kiyoshi and Kiyoko Tokutomi, which continues to thrive with its journal Geppo, monthly meetings, an annual contest and anthology, and its much-loved haiku retreat at the Asilomar Conference Center near Monterey. The Leanfrog group was also active in the San Francisco area in the late 70s and early 80s, led by Louis Cuneo, who also published Leanfrog from 1979 to 1982, as well as a number of haiku-related books from his press. In 1987, San Francisco was host to the East-West Haiku Conference at Hotel Nikko in San Francisco, sponsored by Japan Air Lines, an event that attracted Kazuo Sato, the international director of Tokyo’s Museum of Haiku Literature, and Makoto Ueda, the widely respected haiku translator from Stanford University (later chair of the Asian Studies department), among others. This event galvanized many haiku poets in the area to again meet informally. Later, in 1989, came the formation of the Haiku Poets of Northern California by Garry Gay and Jerry Kilbride, another landmark event for California haiku up to that point. HPNC has been one of the most prominent local groups in the country, making a national mark with its journal Woodnotes, and later Mariposa, and its annual Two Autumns readings, which started in 1990 (the longest continuous haiku reading series in the country). HPNC is also known for its annual contests, Garry Gay’s creation of the rengay form, many group anthologies, and more. In 1997, Jerry Ball started the Southern California Haiku Study Group, and in 2002 its members created and hosted the first Haiku Pacific Rim Conference in Long Beach. In 1999, Jerry Kilbride started the Central Valley Haiku Club, with its strong support of haibun (through an annual contest). Both groups have regular meetings and publications, and have hosted national quarterly meetings of the Haiku Society of America. And in 2010, a new group, Haiku San Diego, started in the southernmost part of the state, cofounded by Billie Dee, Naia, Eric Houck Jr., Megan Webster, and Seretta Martin. Northern California is also home to Jane Reichhold’s AHA Books, and the AHA Poetry online site. Jane published the journal Mirrors for many years, and currently publishes Lynx with her husband Werner Reichhold. In 1989, Michael Dylan Welch started his press, Press Here, which for many years, along with AHA Books, was one of the country’s most prominent small publishers for haiku poetry, winning many Merit Book Awards from the HSA. He later started Tundra: The Journal of the Short Poem in California. Since 2000, D. F. Tweney has also been publishing haiku, mostly every day, in his online journal Tinywords. More recently, too, Carolyn Hall has taken over the journal Acorn from A. C. Missias and moved it from Pennsylvania to California. 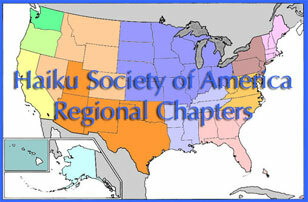 In 1991, the Haiku North America conference had its start at Las Positas College in the Bay Area. The conference is held every two years at various locations around the continent, operated as a nonprofit California corporation directed by Michael Dylan Welch, Garry Gay, and Paul Miller. It is the largest and oldest ongoing haiku conference outside Japan. And in 1996, the American Haiku Archives was founded at the California State Library in Sacramento. This archive, which includes the official Haiku Society of America archives, is believed to be the world’s largest public collection of haiku materials outside Japan. While each of California’s active haiku groups is independent of the Haiku Society of America, their membership rosters overlap extensively, and together they contribute to the vibrancy of haiku in California. The HSA’s California region as a whole does not usually have its own meetings, but you are encouraged to contact the California regional coordinator or any of the independent organizations for more information about their activities. The fall quarterly meeting of the Haiku Poets of Northern California was held on Sunday, October 16, 2016. The meeting was opened by HPNC president, Garry Gay with a round of introductions and poems. The following people were present: Susan Antolin, Fay Aoyagi, Stephanie Baker, Lynda Beigel, Chuck Brickley, Bruce Feingold, Garry Gay, Deborah P Kolodji, Beverly Acuff Momoi, Renée Owen, Cheryl Pfeil von der Heyde, Sharon Pretti, Michael Sheffield, and Joan Zimmerman. Following Debbie's reading, we shared announcements, including the date of the next HPNC quarterly meeting (January 22, 2017); the deadline for the HPNC-sponsored Rengay contest (January 31, 2017); and the next Mariposa deadline (March 1, 2017). Bruce Feingold announced the publication of his new collection of haiku, Old Enough, by Red Moon Press, and he also mentioned that his haiku are featured during the month of October on the Mann Library website, coordinated by Tom Clausen. Bruce also reminded everyone to nominate their favorite individual haiku or collection of haiku for the Touchstone Awards. Details on the Touchstone Awards and how to ate poems and books can be found on the Haiku Foundation website. Garry also noted that while it may seem early to book rooms for the 2017 Haiku North America conference, rooms at the main hotel where the conference will be held in Santa Fe are filling up. He also gave an overview of the various kinds of presentations and other activities that make the HNA conferences so worthwhile to attend, particularly the chance to meet face-to-face with poets you have long admired. HNA is a great opportunity for haiku poets from all over the U.S., Canada, and even places as far away as New Zealand, Australia, Europe, and Japan, to gather in one place, share thoughts about haiku and enjoy each other's company over meals and late into the evening at the hotel bar. From what Garry and others have heard informally, the upcoming HNA is likely to be very well-attended, in part because Santa Fe is such a desirable place to visit. Michael Sheffield announced that he has been designated the Poet Laureate for the Jack London State Park and that he has done numerous readings of his free verse poetry at events in the Sonoma Valley. For the remainder of the afternoon we enjoyed a thoughtful and engaging presentation by Beverly Acuff Momoi on the Vertical Axis in Haiku, a talk she presented in a slightly different version at the Haiku North America conference in Schenectady, New York in October 2015. While Bev had written haibun previously, she more fully embraced the haibun form as a way of responding to the March 11, 2011 earthquake and tsunami in Japan. A collection of those haibun, Lifting the Towhee's Song, won an e-chapbook award from Snapshot Press and is available online on the Snapshot Press website. Bev provided a handout with useful quotes and examples of haibun that she referenced as she spoke. Bev began exploring the topic of her talk by asking herself what it was about certain haibun that made them stick with her while others were less memorable. The foundation of that sticking power, she decided, was that successful haibun are ones that engage the reader on multiple levels. Great haibun, she noted, are more than a simple retelling of lived experience. In fact, while many haibun do tend to deal with autobiographical experience, Bev cautioned against assuming that haibun are autobiographical, as that is often not a valid assumption. Fiction is just as valid in haibun as the more common memoir or travel diary style of writing. Bev proposed looking at haibun from the reference point of the landscape architecture of Japanese gardens. She pointed out that a landscape artist needs to consider how the garden is experienced and how each view is framed. Similarly, a writer needs to consider the way in which the haibun is framed for the reader. challenge for non-Japanese writers is how to make a connection when we do not necessarily have a common base of historical knowledge upon which to draw. Bev had volunteers read sample haibun from the handout aloud, and she then elicited discussion of the ways in which each haibun succeeded in capturing and holding our attention. Among those she examined were "Visitation" by Terri French, "Proper Nouns" by Melissa Allen, "Ishmael" by John Stevenson, "Instructing Mona Lisa" by Peter Butler, "Fortieth Birthday" by Guy Shaked, "Exposure" by Cherie Hunter Day, "Venn Circles" by George Swede, and "The Blue Jacaranda" by Kala Ramesh. Incorporating biblical overtones, literary allusion, musical references, well-known works of art, or simply appealing to shared elements of the human condition are among the many ways in which the vertical axis can be developed in haibun. Bev emphasized that there are many choices you can make to enrich your work. Thinking about haibun in terms of both the vertical and horizontal axes and considering where on that framework your haibun resides, is a tool that many writers may find useful and inspiring as they explore haibun further. HSD members reviewed segments of Carmen Sterba's article in Simply Haiku, Autumn 2007, titled Thoughts on Juxtaposition, in which she states that "experimenting with different types of juxtaposition may add the depth that creates a memorable haiku; one that does not fail to reverberate again and again." We discussed whether or not haiku have to follow the fragment/phrase format for juxtaposition to occur in the 3-line format; can juxtaposition occur in a single image haiku. The Heron's Nest online journal over the course of three issues. We looked for the small gaps and explored the depth and energy they added. Lastly, we briefly touched upon haiku forced into the 5-7-5 format versus naturally, effortlessly falling into the 5-7-5 format, with examples of each. Naia distributed a list of 11 one-line haiku published in the current issue of The Heron's Nest, and 9 one-line haiku published in The Haiku Anthology, third edition, 1999). Members discussed each, identified which category best described each, and identified those we felt were failed one-line haiku (falling into Higginson's 4th category). We also observed the growth and refinement of one-line haiku that has occurred between 1999 and 2016, as evidenced by our sample poems. During the final segment of our September and October meetings HSD members participated in an anonymous haiku workshop. The Southern California Haiku Study Group met for its regular workshop at the Lamanda Park Library, 140 S. Altadena Dr, Pasadena, CA 91107. After a read-around of haiku by the poets in attendance (Deborah P Kolodji, Janis Lukstein, Kimberly Esser, Toni Steele, Sharon Yee, Mary Torregrossa, Gregory Longenecker, Kathabela Wilson, James Won, Patti Harrison, and Jonathan Yunkins), Debbie Kolodji conducted a workshop on the use of articles in haiku. Recent issues of Acorn, bottle rockets, Hummingbird, Kokako, and Haiku Canada Review were available for browsing, as well as "over our heads" by Michael Ketchek, "bird song" by LA Davidson, and "street chatter fading" by Abigail Friedman. An anonymous haiku workshop rounded out the afternoon, with haiku written from the following fall season words: pumpkins, apples, persimmons, leaves changing/falling, Halloween, autumn light, Santa Ana winds, remaining heat, autumn deepens, migrating birds/butterflies, football season, election season, nuts and seeds. Some wonderful poems resulted and we're looking forward to hopefully seeing some of them in print one day. On October 8, 10 poets of the Yuki Teikei Haiku Society met at the Markham House in the San Jose History Park. After the attendees enjoyed a ginko on the History Park grounds, Patrick Gallagher led a workshop on haiku composition using a format that he had enjoyed as a guest of the Washington D.C. Towpath Haiku Group. In this format, a poem is anonymously presented to the whole group, and members of the group provide appreciation and/or helpful suggestions for improvement. Patrick added a high tech element to the workshop, with a scribe (Joan Zimmerman) writing the haiku and suggested revisions out on an iPad, which was projected on a screen for all to see. The new YTHS digital projector and screen worked nicely for the exercise. The June 18 meeting of the Southern California Haiku Study Group in the Blue Room of the USC Pacific Asia Museum will be its last for about a year, as the museum will be closed for seismic retrofitting. The workshop was attended by Lynn Allgood, Marcia Behar, D'Ellen, Kim Esser, George, Bill Hart, Debbie Kolodji, Elva Lauter, Greg Longenecker, Victor Ortiz, Wakako Rollinger, Toni Steele, Mary Torregrossa, Patricia Wakimoto, Kathabela Wilson, James Won, and Sharon Yee. After a read-around of haiku, we discussed the most recent re:Virals post from The Haiku Foundation where Jo McInerney commented on the following poem by Basho (re:Virals 40). Before reading McInerney's commentary as a group, Debbie Kolodji put the haiku up on the white board and led a group discussion. Observfd and the sense of potential abandonment - is it an abandoned nest, is it an abandoned house? We talked about how the haiku changed a bit when the translation was "bee" versus "wasp." Then, we also discussed the sense of detachment and objectivity as in McInerney's discussion. Finally, we looked at 10 haiku in the June 15, 2016 issue of The Heron's Nest, including the editor's choices, <http://www.theheronsnest.com/June2016/editors-choices.html>, and discussed how different levels of objectivity and detachment worked in each poem. A couple of the poems were objective, others were more subjective, and we discussed how we could fine-tune our own haiku by using these different levels of objectivity. Starting on July 15, 2016, for at least a year, the SCSHG will meet at the Lamanda Park Library, 140 S. Altadena Dr., Pasadena, CA 91107. This includes the August 20, 2016 workshop with David Lanoue, previously announced to be at the Whispering Pines Tea House. As our YTHS group headed out from the Tea House at 11:00 AM for a docent-led tour of the Japanese Friendship Garden in San Jose CA, we were grateful for the gorgeous spring weather. While our docent, Kathy Tanaka, stopped along the walkway, we listened intently to her informative talk. Some enjoyed the sun while others scampered for shade under a canopy of burgundy-leafed plums and other shade-offering trees. As Kathy pointed out the water fountain flowing over Stone Turtle Island, we were told there are no live turtles allowed in the ponds due to problems with disease. At a stop alongside one of the ponds midway through the garden, Kathy generously gave us each a handful of koi food pellets. We tossed them out and about for the large, eager, multicolored koi, and as she requested, tried to avoid the many ducks and geese. But they had their adept, webbed feet ready for action as they made a quick dash through the water to get their fair share! The shadows of some small manicured pines at the edge of one pond were a painter's delight; they looked like a simplified ink painting. The shadows were an effective contrast to the real pines with their shapely trunks and thickly needled green boughs. The tour was lovely, leisurely, and well informed, an enjoyable precursor to the gathering at the Tea House for a delicious lunch, refreshments, and an afternoon of fabulous haiku readings! The four-featured readers of the day were: Mimi Ahern, Cherie Hunter Day, Marcia Behar, and Elaine Whitman. Sadly, Cherie was unable to attend due to a death in her family. The other three shared their haiku, each in their own unique way. Quinceañera day . . .
Before we departed the beautiful tea house, poets contributed poems which were gathered up by Patricia Machmiller to create a "haiku sympathy bouquet" for Cherie Hunter Day. June 12, 2016, Haiku San Diego (HSD) Regular Monthly Meeting. On another gorgeous San Diego day we met at Java Joe's. Attendees: Donna Buck, Sue Campion, Anita Guenin, Carol Judkins, Robert Lundy, Seretta Martin, Naia, Claudia Poquoc, Karen Stromberg, Elizabeth Yahn Williams. Carol Judkins lead an informative and inspiring interactive workshop titled "Exploring Haibun". She handed out packets of information and reference materials she'd prepared to facilitate our exploration and understanding of the form, and lead discussions about haibun guidelines and aesthetics. Members discussed such topics as haibun form and styles, point of view, voice, tense, and focus, as well as the role of haiku in the haibun form. Carol shared haibun exemplars, which we discussed in depth. Then members participated in a writing exercised. Carol handed out several published haibun with the author and the haiku removed. Members spent about 10 minutes writing haiku to one or more of the haibun prose sections, and we shared and discussed each and the shifting juxtapositions they created. Finally Carol revealed the author and haiku for each. It was a great way to explore nuances in the juxtaposition of haiku to haibun. During the last 15 minutes of our meeting, HSD members participated in an anonymous haiku workshop.